Note: This build has not been fully optimized as I don't have time to do so. I also made some small untested changes to the tree and removed Watcher's Eye, but the build should be the same or better at a lower cost. Broken DPS -21,474,836.00 (info about this number: https://en.wikipedia.org/wiki/2,147,483,647#In_computing). Estimated DPS 25M+ with 11 arrows. 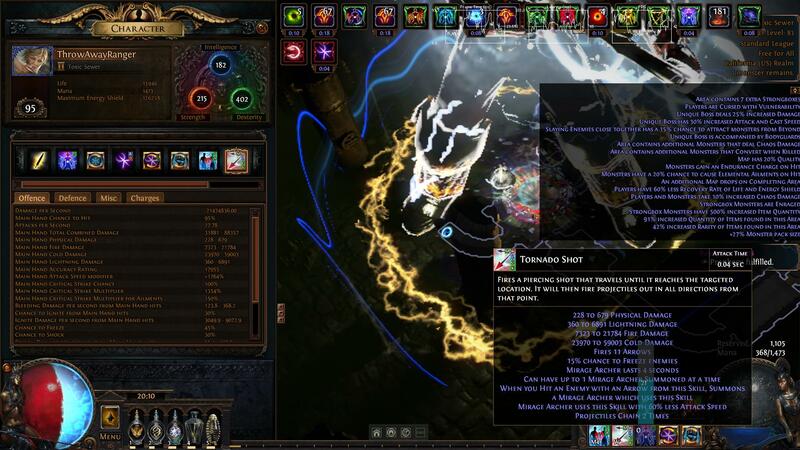 Most of the cost comes from the Headhunter, but the build will work without it (build cost 33ex). I have tested a T16 beyond map to confirm. Everything dies instantly and automaticlly with Mirage Archer when you have your buffs, so most of the time there will be nothing to deal damage to you. The only time you could die is before you get life, ES, and damage buffs, or while amulet swapping (see mechanics section). With Temporal Chains, and easy 10k+ EHP, you should rarely die. Without any HH buffs, the build has about 4.7k life, and 30% dodge. Based on my character "ThrowAwayRanger"
Note: This guide does not cover all possible ways to play The Broken Build. 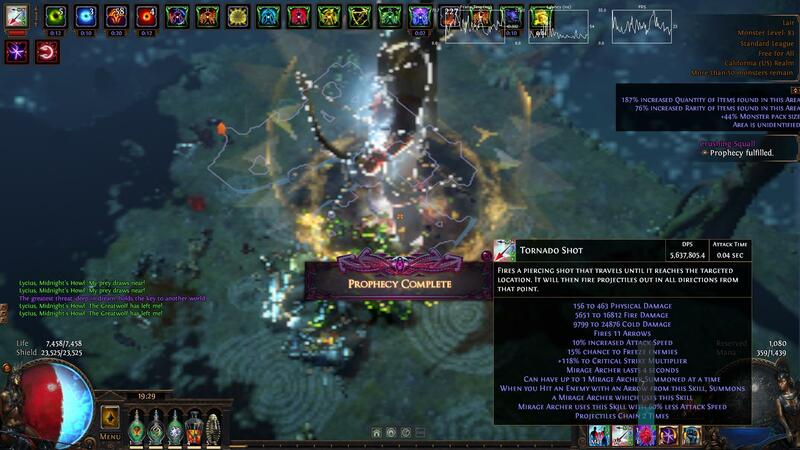 But once you understand the mechanics, you'll be able to make this build work with any skill and class you want. -The build gets its power from rare monsters you kill and gain mods from, and from souls you gather for Soul Eater. You gain mods from rare monster with both Inspired Learning and Headhunter. Soul Eater is gained reliably from Zerphi's Heart by using a Vaal Skill. The duration of the mods and Soul Eater are 20s and 10s repectively. See "Map Choice" for more info on Soul Eater mechanics. 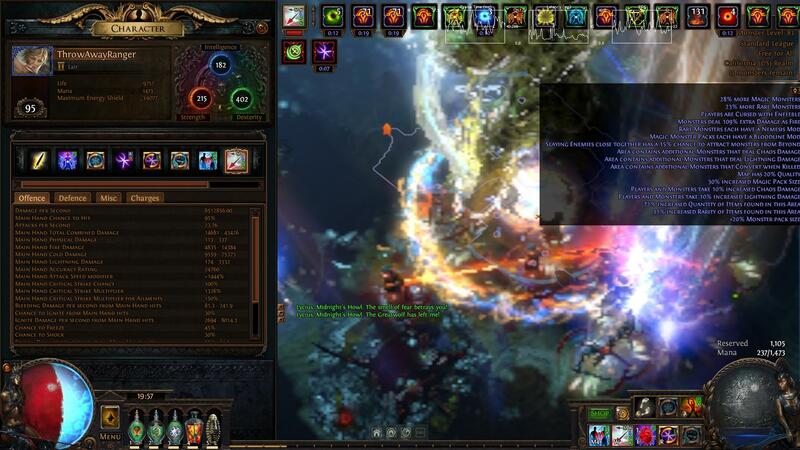 -To maintain the very high mana cost while attacking 25 times/s (925 mana/s), Vaal Clarity is used. No other Vaal Skills are used or recommended as they will take souls that you would normally gain for Soul Eater. 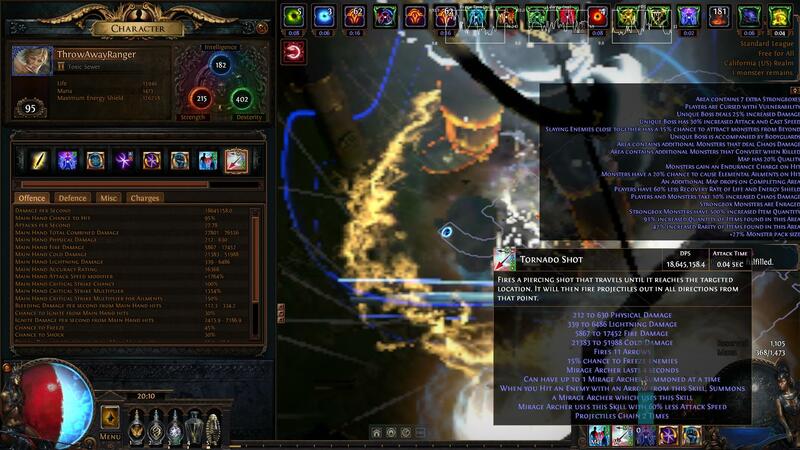 Note: Soul Ripper can be used to 100% reliably sustain Vaal Clarity, but it's not needed. 2. Freeze and kill monsters so your Herald of Ice procs and curses on hit enemies with Temporal Chains which is then reflected back to you. Map: Elemental Reflect. Physical Reflect (unless you convert most physical damage). No Leech can be challenging, but doable with Cinderswallow. I use Major Soul of Solaris and Minor Soul of Tukohama or Ralakesh. Level as anything else to at least 91, then respec to tree 2b and continue with tree 2a. 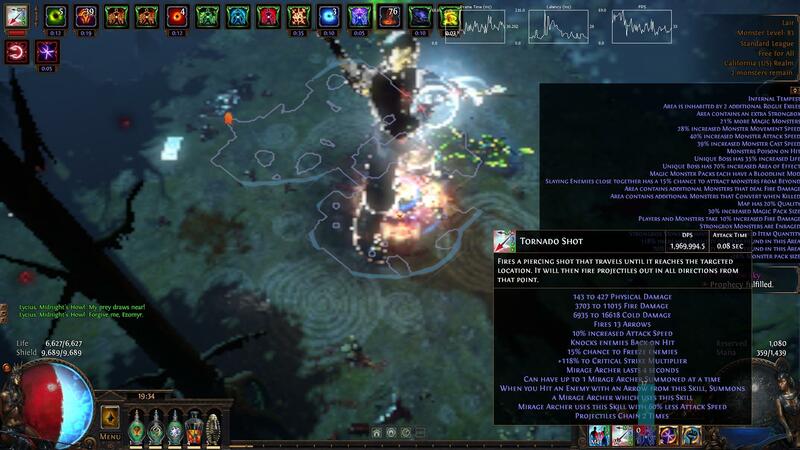 Bow/Body Tornado Shot: Pick any gems you want depending on whether you want more DPS at the start of maps, or when you have buffs. Take off the amulet to see the rough DPS at the start of maps. Bow/Body (Temporal Chains + Frenzy + Aura): Depending on what colors you manage to get, you can put Vaal Clarity or Hatred here. Frenzy is optional, but useful at the start of maps. Gloves Herald of Ice Curse on Hit: This must go in the gloves to reflect Temporal Chains. Increased Crit Strike support reccomended as it will allow your HoI to hit 100% crit chance with HH buffs, and over 1000% crit multiplier. Helmet Blink Arrow + Aura: Put Hatred or Vaal Clarity in the helmet. 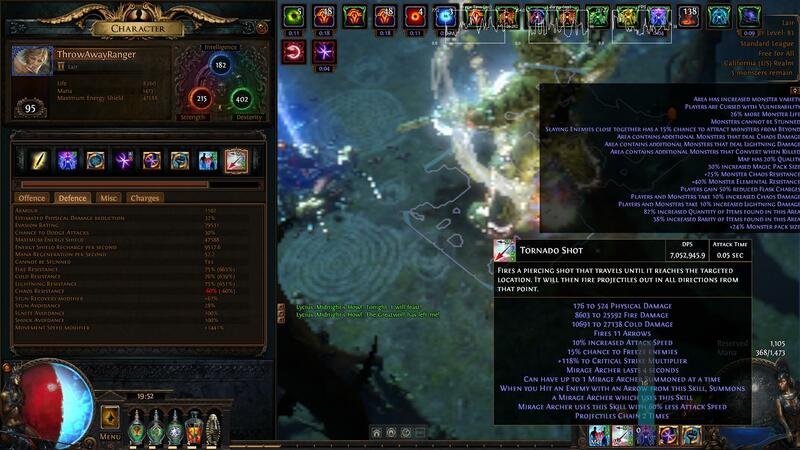 Weapon: Physical damage scales best with Headhunter, so choose any high pdps bow you want. Quiver: Any +1 chain quiver you want. Helmet: Any helmet with a useful enchant, high intelligence, life, resists, evasion. Body Armour: Any body armour will work. I chose Queen of the Forest for maximum movement speed at the start of maps, and for life and resists. Gloves: +1 Frenzy implicit gives the most DPS. Otherwise you can use enfeeble or elemental weakness on hit with a +1 curse amulet. Rings: The Taming probably best. Belt: Headhunter, or Coward's Legacy reccomended. But with enough curse effect, you can use any belt you want (ie. Bisco's Leash). Flasks: Get ignite immunity somewhere. Cinderswallow is reccomended, but can be replaced with any flask such as Atziri's Promise. Jewels: Get the implicit "Corrupted Blood cannot be inflicted on you" on one of the jewels if you can, or use a bleed immune flask. Helmet: 30% Increased Temporal Chains Curse Effect, or +2 Tornado Shot secondary projectiles if you use Coward's Legacy. Do you need Inspire Learning if you already have HH? you're also using someone else's video for your build. you mean bosses in maps because you won't kill any actual bosses like shaper, uber elder or delve bosses without headhunter buffs. Yes, because with 3 inspired learning, you essentially double the Headhunter buffs you gain. Each rare monster has 3 affixes, and each inspired takes 1. So with Headhunter and 3 inspired, you get 6 mods from 1 rare on average. 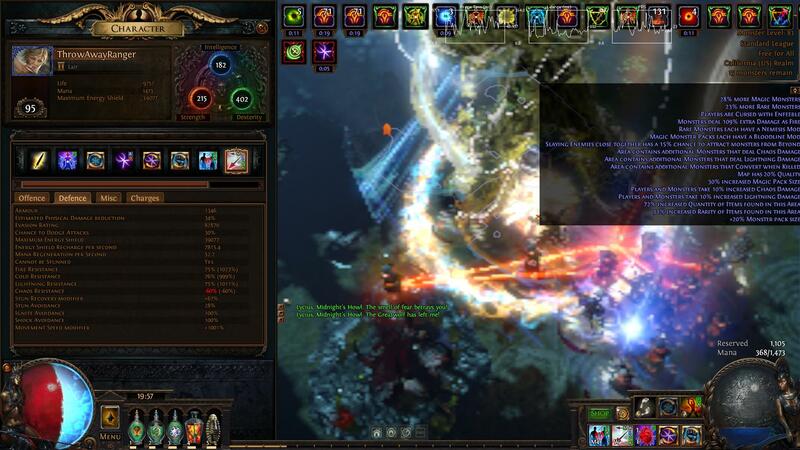 Auras don't stack iirc, so maybe you'll get 5, or 6 if it takes the same mod twice. Read the mechanics section. You only get Soul Eater from Zerphi's Heart. Yes, I'll edit that to be clear. you wont get 80sec headhunter buffs without solstice vigil if you're not occultist. You say in your build that you have Soul eater but then recommend solstice vigil as an amulet. Are you serious? is this a 1st april prank. 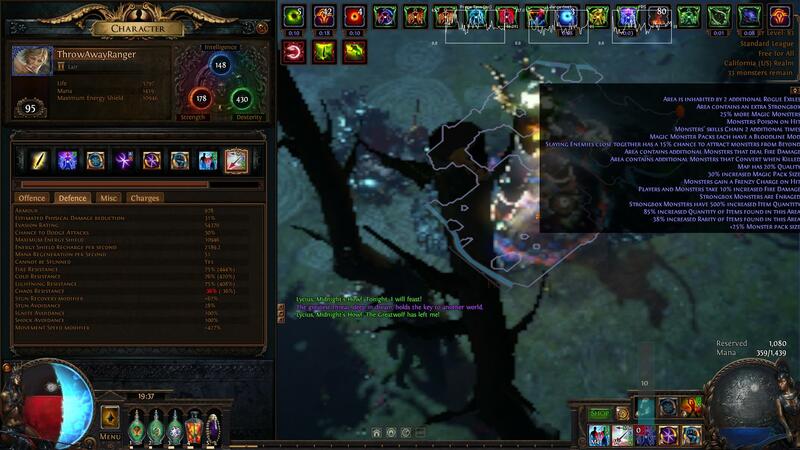 bro HH in legaue alone is 50ex, not even talking about +curse solstice vigil or zerphis u serious? Are you trolling me, or are unable/unwilling to read the build guide? You only need to swap at most twice a map, and every 40s. The cost is shown exactly in the PoB. Look at it for a breakdown. I won't be replying to anymore troll comments. You only need to swap every 40s. Your build is a troll build from start to finish. You don't even have a league character on your account. And it's also not your build you stole the exact same deadeye build that the original guy did (the one that you posted the vid of). Considering this was posted on march 31st, is this build an out of season april fool's joke? 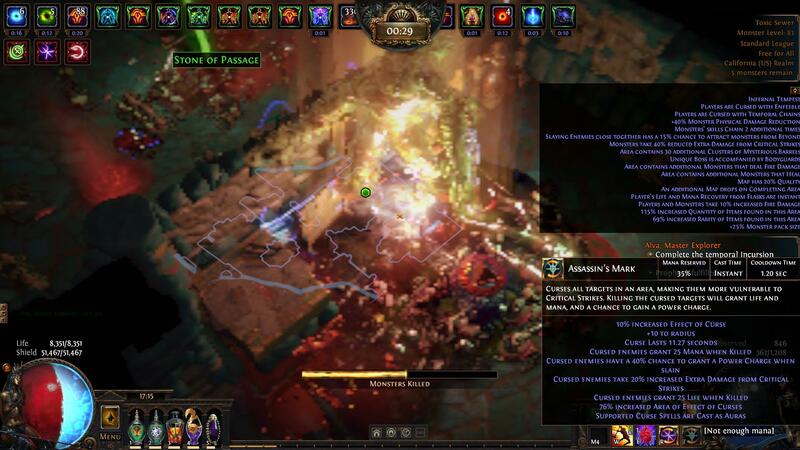 The PoE community must be really toxic if you think this isn't a real build.